Brian Talley welcomes everyone to the 25th Anniversary of the Marianne Talley Memorial Fun Run. 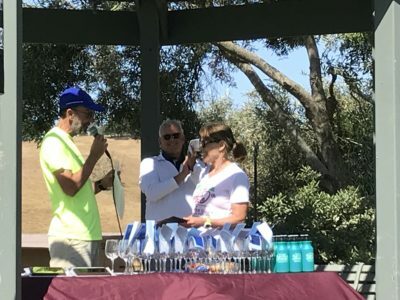 Blue skies and a cool coastal breeze greet hundreds of people on Sunday morning, June 3, as they gather at Talley Vineyards in Arroyo Grande. 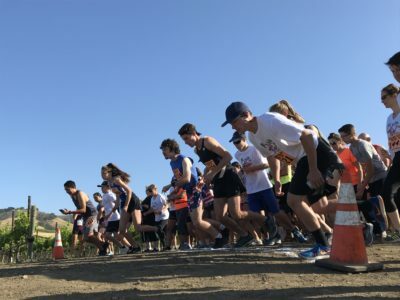 From many communities along the Central Coast, more than 300 runners and walkers of all ages are taking part in this special day: the 25th Anniversary of the Marianne Talley Memorial Fun Run. As entrants in the 5K, 10K, and 1-mile walk gather at the start line, Brian Talley welcomes everyone. 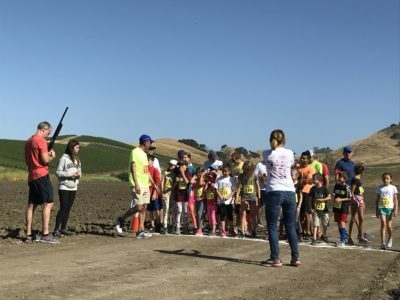 At the shotgun start, runners and walkers begin their races through the vineyards and farmland visible just outside the tasting room at Talley Vineyards. Each intersection is marked with enthusiastic volunteers cheering on the participants. One incentive for 5K runners: cross the finish line before Brian Talley to earn the “I Beat the Vintner” t-shirt. The shotgun start for the 25th Anniversary Fun Fun. The fastest 5K runners cross the finish in less than 20 minutes to applause and shouts from the crowd of family, friends, and community members. More 5K runners, plus walkers in the 1-Mile course and the first 10K runners, pass under the bright red FINISH sign. Now it’s time for the best part of the morning: the Youth 1-Mile Run. With earnest faces, the 35 young athletes from 3 to 13 years old toe the start line, waiting for the shotgun to set them loose. We cheer, and in just a few minutes, they, too, begin crossing cross the finish of the 25th Anniversary Marianne Talley Fun Run. 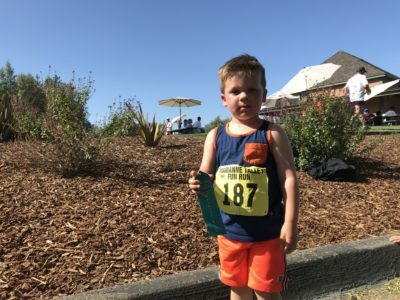 The 8-year-old winner from Arroyo Grande clocked a 6.41 mile. The Youth 1-Mile race brings kids 3 to 13 to the starting line. And while one focus of the day is about finish times, it’s really about kicking off Arroyo Grande High School students’ college careers through the three scholarships awarded every year by the Marianne Talley Foundation. Brayden Pinkerton, recipient of the 2016 Don Talley Leadership scholarship, explains what is so special about receiving a Marianne Talley Foundation scholarship. Pinkerton, who played baseball and football at AGHS, placed second in his age group’s 5K today. Three-year-old Harrison runs a strong race in the Youth 1-Mile Run. Emily Sonny, who participated in AGHS volleyball, water polo and swimming, received the Marianne Talley scholarship in 2016. A current Agribusiness major at Cal Poly in San Luis Obispo, Sonny shares how much the scholarship inspires her. 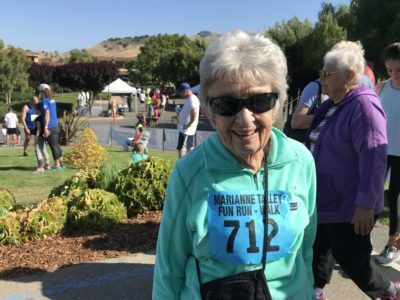 The Talley family created the Marianne Talley Foundation in memory of Marianne Talley, who earned her Bachelor’s Degree in Exercise Science from University of Southern California and her Master’s Degree in Wellness Management from Cal Poly San Luis Obispo. She also competed as a runner, swimmer, cyclist, and triathlete. 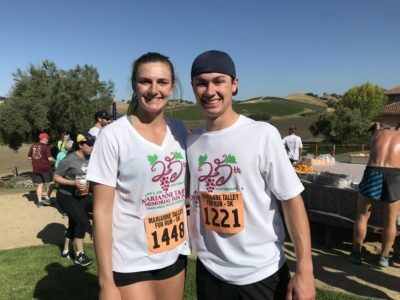 Because the Talley family shares a love of fitness, athletics, and education, they wanted to create a way to remember Marianne in a way that would benefit others and the community through a scholarship program. Emily Sonny and Brayden Pinkerton, recipients of 2016 Marianne Talley Foundation scholarships. 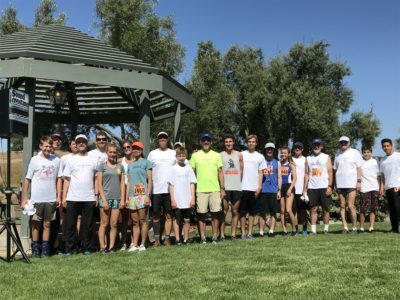 The Fun Run is the primary fundraiser for the Marianne Talley Scholarship Foundation, which awards three separate scholarships: The Marianne Talley and Oliver Talley Memorial Scholarships, which are awarded to student athletes, and the Don Talley Leadership Memorial scholarship, which is given to an academic student. All scholarship winners are nominated by the school’s coaching, athletics, and administrative staff. To date, the Marianne Talley Foundation has awarded $322,000 to 58 Arroyo Grande High School students. Anne Sinsheimer looks forward to walking the course every year. Jorge Aguilar, principal with Wallace Group, is joined by more than a dozen coworkers and family members in burgundy team shirts. Wallace Group has sponsored the event for five years. Wallace Group has been sponsoring the Fun Run for five years. Aguilar placed 1st in his age group. 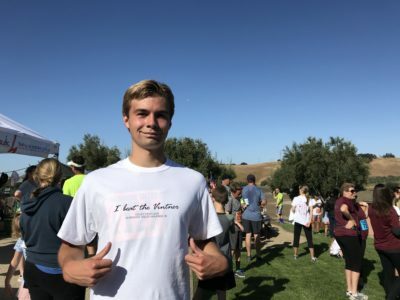 His son, Joshua, who attends Central Coast New Tech High School in Nipomo, earned an “I Beat the Vintner” t-shirt for the first time this year. Joshua Aguilar earns his first “I Beat the Vintner” shirt at the 2018 race. The crowd settles in on the grassy slope outside the historic Rincon Adobe for the awards ceremony. Before the race results are announced, Brian Talley shares special recognition for Marian Fiorentino, race director, who is retiring after today’s race. Brian Talley thanks Marian Fiorentino for her years of serving as race director. 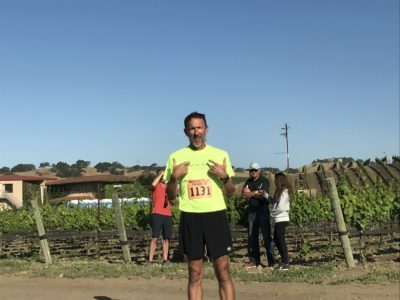 Talley came in 2nd in his age group this year, and he welcomes the 28 runners who earned their “I Beat the Vintner” t-shirts to come up for a group photo. 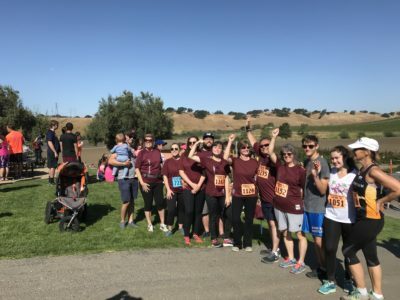 This year, 28 5Krunners earned their “I Beat the VIntner” commemorative t-shirts. Then he shares the great news and a milestone for the 25th year of the Marian Talley Foundation. As the 25th anniversary Fun Run comes to a close, 323 runners and walkers from ages 3 to 88 will have made this a day to remember. Camaraderie, support, community, and enhancing future generations of leaders from Arroyo Grande High School. That’s a race to remember.